The new waterproof* cartbag weighs only 2600 grams and is made from specially coated waterproof Nylon fabric. All pockets and seams are waterproof taped and sealed. Zipper tunnels prevent water from soaking into the bag and pockets. Each club is stored safely and fixed in one of the 14 panels of our new 14 way divider with 2 moulded handles and a separate putter compartement. 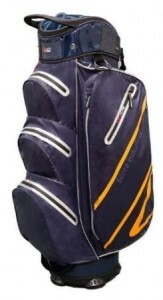 The professional carry system can be individually secured on the front, as well as on the backside of the bag. The outside pockets are all facing the front, this allows a very easy access. Waterproof battery bag on the back-side. Umbrella holder, a padded pocket for valuables, 2 (!) super-size cooler side-pockets and a rainhood satisfy all wishes. Bag weight 2600 gram, divider size 9.5”. * Bag is waterproof when the rainhood is used as designed in conjunction with the bag and all zippers are closed completely. The recent WATERPROOF series - highest technical standard and many useful details.